I never knew how comfortable a couch could feel until I camped at 8000 feet with two tiny kids. I'm sitting here on my sofa, considering the madcap adventure we just completed. Two weeks ago, I could barely manage daily life with the two kids in my perfectly comfortable house; how was I going to camp on a mountaintop with no running water? I couldn't even make it to Safeway with both kids; how would we drive halfway across the country? This whole thing was my idea, but I was dreading it. I knew we'd survive, but I just couldn't wrap my brain around how we'd actually manage to enjoy any of it. I second-guessed it from every angle. I didn't feel adventurous at all. I cried once--okay, twice, while packing. But the great thing about travel is, it will surprise you with your own capability. It can bring out the best in you and yours, if you let it. Kids rally. Adrenaline you didn't know you had kicks into gear. Inevitably, everyone will reach the end of his or her rope at some point, but afterwards, your ropes are a little longer than they were before. 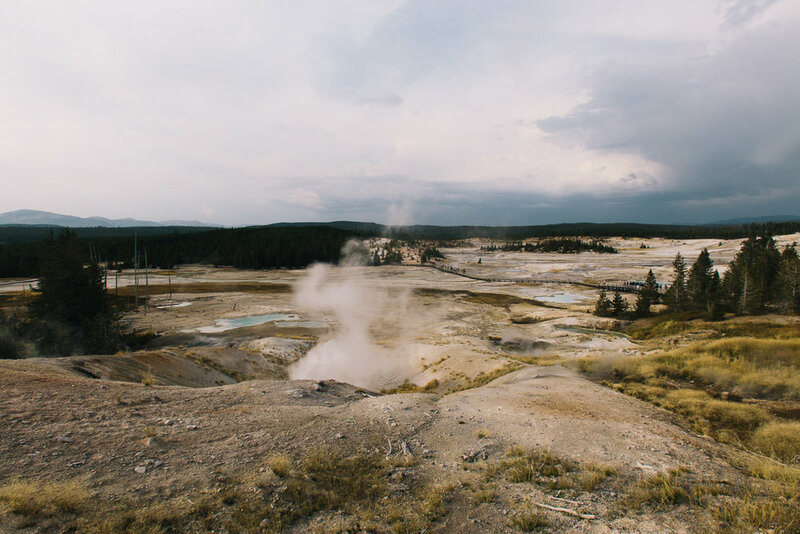 Why did we pick Wyoming for our first huge family adventure with two kids? Well, ten years ago, I was in a band, and at some point we all agreed to drop everything on August 21, 2017, and meet on Casper Mountain for the Great American Eclipse. This year, despite having a baby, we figured we would just find a way to make it happen, and build an adventure around it. 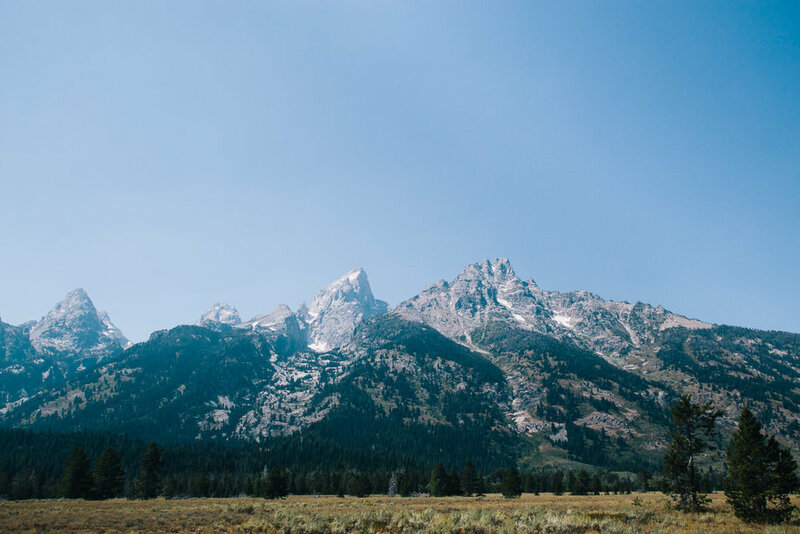 We put it on the calendar, tacked on a couple extra days for exploring Grand Teton and Yellowstone, and patted ourselves on the back for determining to do it. The only trouble was, planning that kind of trip with two tiny kids was like a high-stakes game of Ticket to Ride, but with a Toyota instead of trains and a screaming car-hating baby instead of the roaming monster. Luckily, I am very good at Ticket to Ride, which gave me the confidence to say yes to this trip. Besides, if there's one thing I've learned about traveling with kids, it's this: plan what you want; figure out the details later. Sometimes it's the mental commitment to do something that gives you the wherewithal to do it. Easier said than done, though. For one thing, I'm not nearly as adventurous as you may think: I hadn't camped in eight years, let alone with a 3 year old and a 5 month old. I like hotels. I REALLY like showers. For another thing, tanks of gas add up, and for the cost of this uncomfortable road trip, we probably could have found an Airbnb on Waikiki Beach for a week (or at least those negative voices in my head kept telling me so). Furthermore, when we were in the thick of the planning process, we had a 3 month old who screamed like a banshee at the very sight of the car seat. But I talked myself off the cliff of canceling it, over and over: I haven't yet regretted an adventure. The Tetons have been calling my name for years. Those two minutes of darkness will be worth it...better be. To tackle the problem of the screaming baby, we devised a game-changing plan: Jordan and Sam would drive most of the way with the camping gear, and Annie and I would fly to meet them en route. (Take that, Ticket to Ride! Can I invent a "Fly to Destination" trump card?) I used SkyMiles to book a quick flight to Salt Lake City. I knew that Sam, who's 3, would do great in the car one-on-one with Jordan; plus, being male, they could pee on the side of the road anywhere in barren old Nevada. I had to swallow my pride a little, because it felt like a cop-out, but you know what? The second thing I've learned about adventuring with kids is this: do what you gotta do. If that means flying part-way, and you can, then do it. By the time August rolled around, Annie was five months old and had finally come to grips with the car, and she did perfectly on the 1600 miles still remaining for us to drive, but I couldn't count on that ahead of time. This plan gave me the peace of mind I needed. The fact is, there's no formula for adventures, nor do you get any bonus points for killing yourself or going deaf in the process. Which is why I flew part-way, and why I packed as many logs of cookie dough as cans of beans. Jordan and I loaded down the 4Runner with a cooler containing nine days worth of food (mostly stuff I cooked ahead and froze: chili, hearty soups full of green stuff to keep us regular on the road, breakfast burritos, yes, and homemade chocolate chip cookie dough--because if I have to camp, there had better be hot cookies), a seven-gallon water jug, all our camping gear, a cigarette-lighter-powered coffee production facility, enough diapers and snacks for an army, my beater fiddle, antelope spray (just kidding! ), and a Wyoming atlas, and he and Sam hit the road. 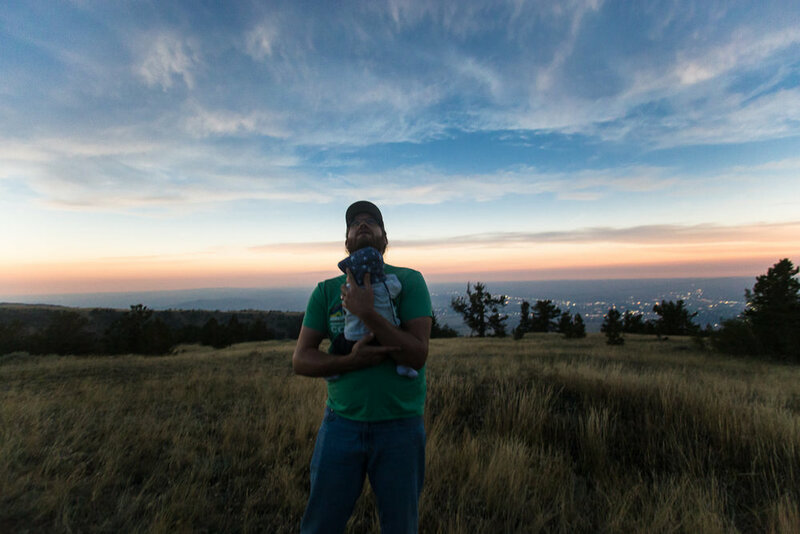 I packed a backpack and the baby, and Annie and I flew to meet them in Utah; then, we all drove the remaining 6 hours to Casper Mountain. We set up camp in the dark, successfully put the kids to bed, and ate dinner overlooking the city lights of Casper. Ha, I thought before dropping off to sleep; all those people who are scared of camping with kids...sissies! Nothing to it! Then 2:17 am rolled around. Sam started screaming bloody murder in his pack-n-play-sized personal tent, cold and scared. Annie woke up in her bassinet, freezing. Within ninety seconds we had two adults and two wriggling children in our double-wide sleeping bag--so much for that romantic wedding gift that we registered for in a moment of newly-engaged idealism. Let's just say the rest of the night was a disaster. Night two, we fell back and regrouped: with two kids, the divide and conquer strategy usually wins, so Annie and I slept in the small tent, Jordan and and Sam in the big one. Everyone got some sleep, including the snakes. On Casper Mountain, I learned two things: one, that the best way to keep a baby warm at 8000 feet elevation in a tent in 30 degree weather is to dress her like a marshmallow. I brought--count them--FIVE pairs of fleece footie pajamas in varying sizes (3, 6, 9, and 12 month sizes, to be exact) to layer upon my petite daughter who, bless her, likes to sleep with a space heater in the summer, and she still woke up cold the first two nights and I had to stuff her in my sleeping bag with me. In case you were wondering, 5-month-olds do not make great bunkmates. The third night, I borrowed a wool sleep sack from a friend, and apparently the 6th layer's the charm--Annie slept all night, unable to move her limbs, reminiscent of Randy in A Christmas Story, and this scene, but nevertheless snug as a bug. The second thing I learned on Casper Mountain is that babies will nap anywhere there are two trees in close proximity, provided you bring a hammock with you. This is not a sponsored post, but I owe my naps to ENO. The other brilliant piece of gear we acquired for this trip was this inexpensive travel bassinet. 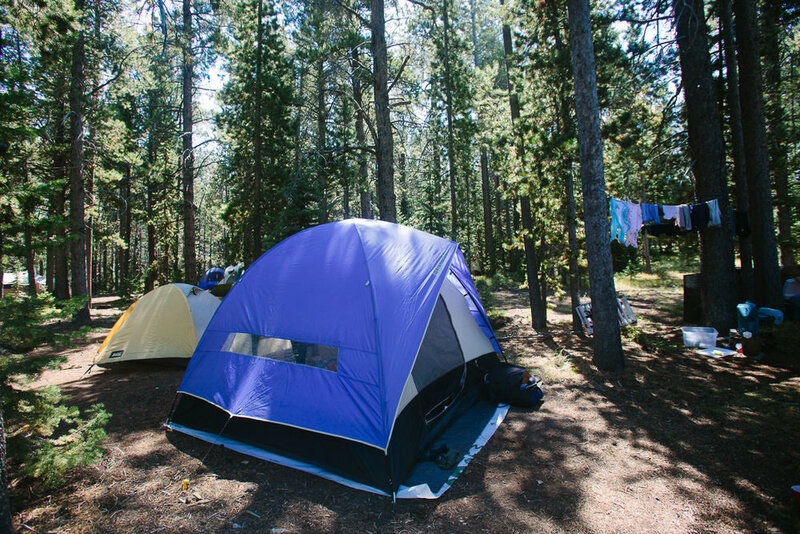 It's lightweight and folds up super small, and it allowed Annie to play on the ground in the woods at our campsite, snooze through mountaintop jam sessions, and take up very little room in the tent. We also stuck her under the hotel room desk to sleep. Hallmarks of a second child; sorry, Annie! After four days of camping and playing music late into the night, and experiencing the total eclipse, we broke camp and headed to Dubois in western Wyoming, our jumping-off point (read: closest place within 200 miles that we could find an affordable motel during eclipse week) for the National Parks. 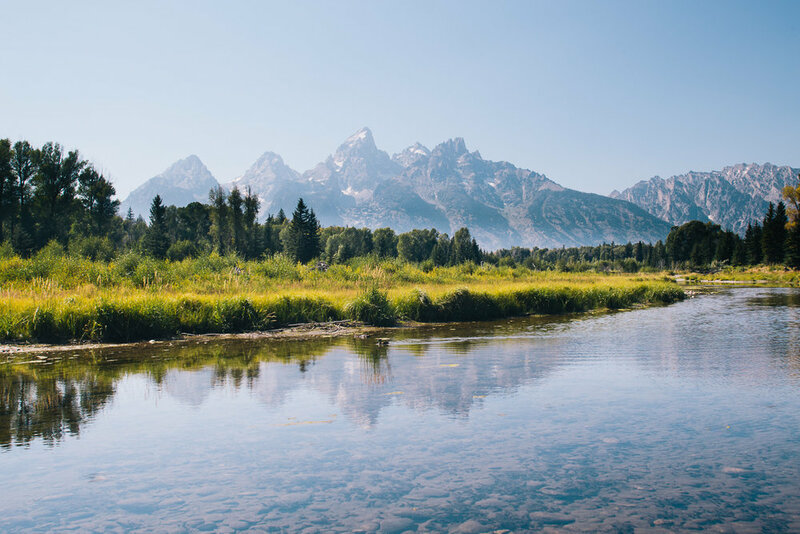 We spent one day each in Grand Teton and Yellowstone, which are adjacent, driving 2-3 hours into each park for the day and then back out to the antler-adorned Stagecoach Motor Inn. This was a very bad idea. We didn't have a choice, as every campsite and lodge in reasonable proximity was full (thanks, eclipse chasers!). 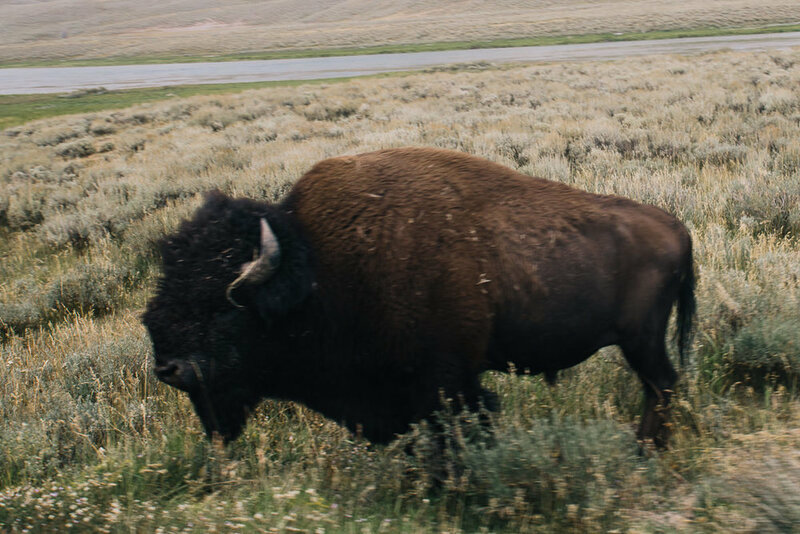 Luckily, the enormity of the Tetons and the immense bizarreness of Yellowstone, plus the scenic drives back and forth through the Wind River Range, made it worthwhile. All across Wyoming, we heated up food on a camp stove in scenic pull-offs, stayed caffeinated via Aeropress with this nifty device (yes, I'm married to a coffee magician), and managed to last until Day 8 without a single grocery stop--and even then, it was only because I desperately needed a salad. 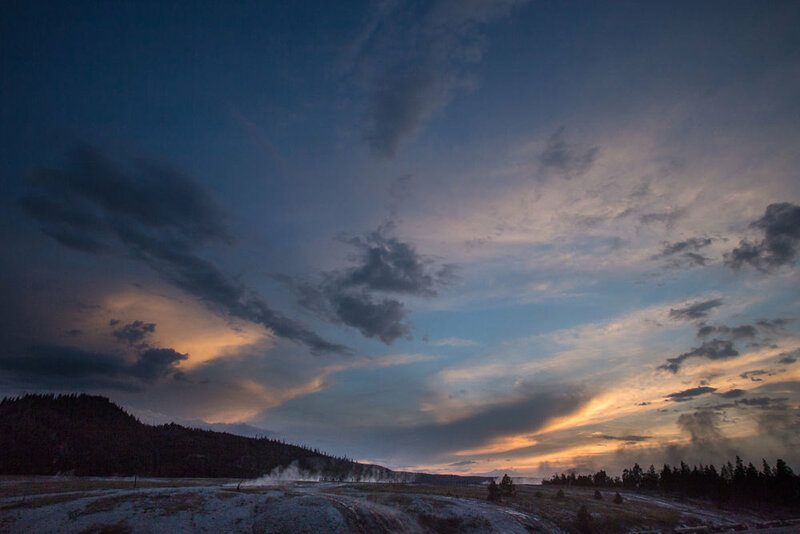 Most nights we kept a general bedtime, but on Yellowstone Day, we took a sunset hike, watched Old Faithful erupt in the dark, heated chili on a camp stove at 10 pm, put the kids to bed in the backseat, and stayed out until after 1 am. And it was the best night of our trip. You know those taffy pullers in candy store windows? This trip was part candy store, part taffy puller. 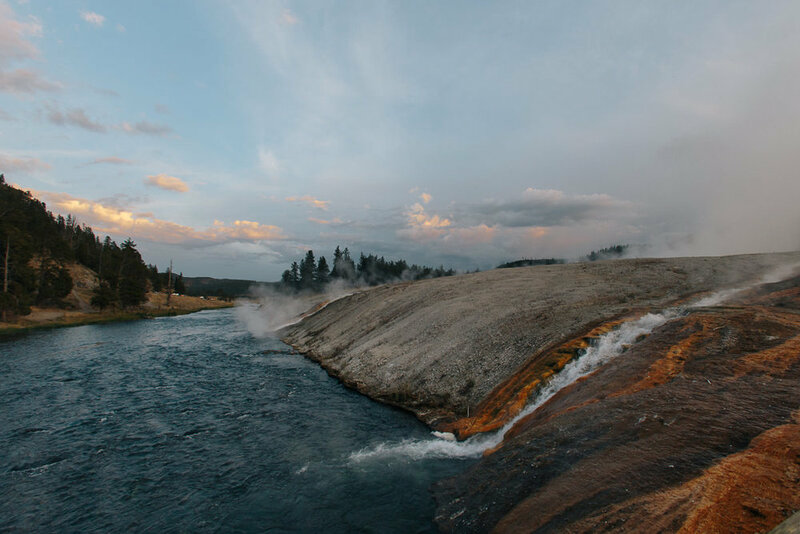 Glaciers, geysers, sunsets viewed through geothermal steam, scenic pull-off lunches beside alpine lakes: candy store. 1200 miles of being squished between car seats, climbing from the front seat to the back 47 times, scenic pull-off tantrums beside alpine lakes: taffy puller. That's okay. We've increased our capacity and upped our game. Meaningful growth requires a certain amount of discomfort. Taking 4 hour drives with Sam makes a one-hour trek to the beach seem like no big deal. 3000 miles to Wyoming makes a day trip drive to Yosemite seem manageable. Primitive camping halfway across the country makes camping close to home seem easy. (Still: don't make me take both kids to Safeway. Please.) We joke that when our last kid leaves for college, we'll probably just stay home and watch TV. When I'm fifty-five, I'll let you know. For now, we're dreaming up our next adventure, because we're not planning to wait until retirement--or for our kids to reach some magic age--to finally explore the world. Armed with an Aeropress and a couple of car seats, we're starting now.